This post is sponsored by Caffeinated Club. All opinions are 100% mine. 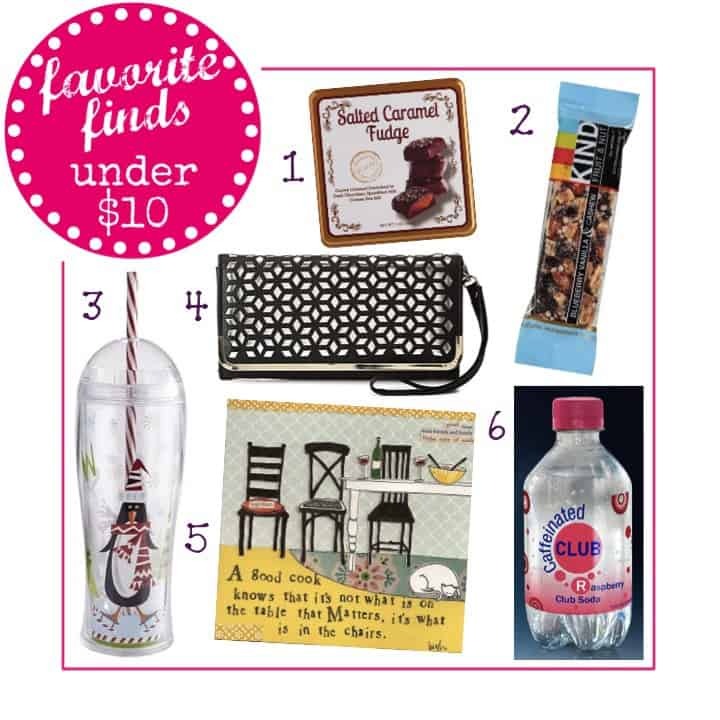 Today I’m sharing more of my favorite finds under $10 just in time for the holidays. These all make great stocking stuffers or if you are out shopping and want to treat yourself to something nice, I highly recommend that too. 1. Salted Caramel Fudge – YUM! 2. Kind Bars – These bars are yummy and you can pronounce all of the ingredients. My favorite is the Blueberry Vanilla. 4. Wristlet – Can you ever have too many wristlets? 5. 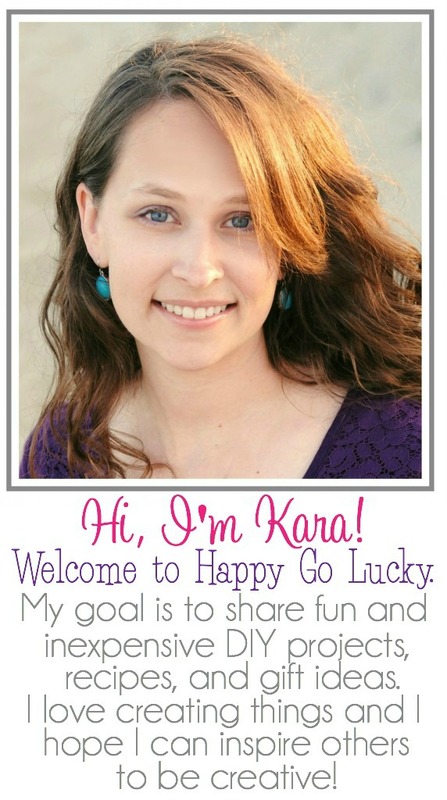 I love this Art Board by Curly Girl Designs! The saying is perfect – A good cook knows that it’s not what is on the table that matters, it’s what is in the chairs. 6. And my latest obsession – Caffeinated Club Soda. 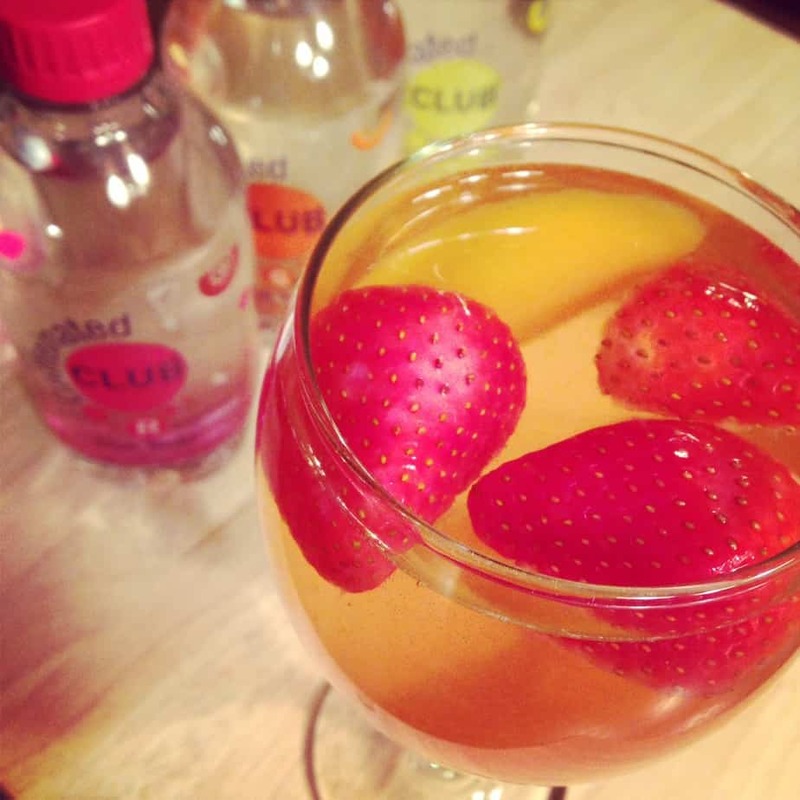 I love sangria and this club soda is perfect alone or used in a delicious cocktail recipe. I actually just discovered Caffeinated Club Soda and I’m hooked. 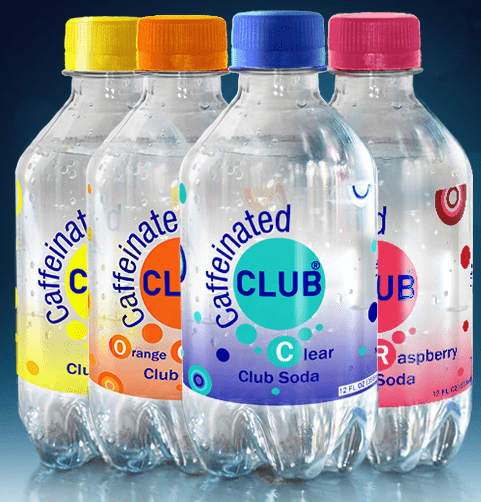 Caffeinated Club flavored club soda with a boost of caffeine is a great tasting choice for soda drinkers looking to give up sugar and artificial sweeteners. Also great for coffee drinkers looking for an alternative that leaves their breath fresher, is calorie fee and is convenient to take anywhere. And it’s for anyone who wants a refreshing lighter alternative to overly caffeinated strong tasting energy drinks. I love that it has zero calories and no added sugar or artificial sweeteners. It’s perfect for when you need caffeine but don’t want to drink coffee or soda. And since I don’t buy soda, this is a great alternative. If you need caffeine during your busy work day but don’t want the extra calories than I highly recommend Caffeinated Club Soda. So I thought it would be fun to also share an easy sangria recipe. This is great if you are hosting a holiday party. Step 1: Add white wine and brandy to pitcher. Step 2: Add sugar and fruit. Step 4: Add club soda just before serving. And guess what? When you order it online, shipping is free anywhere in the continental US so you can stock up now just time for the holidays.